Police are investigating after an armed robbery and a separate carjacking were reported in Boystown early today. No one is in custody. 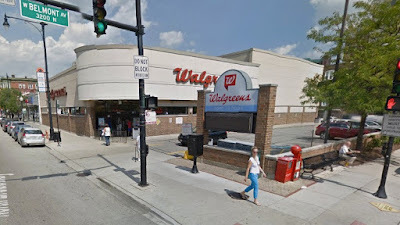 In the first incident, a victim reported being robbed by two men armed with handguns in the Walgreens parking lot at 3201 N. Broadway around 2:45AM. Both offenders fled into a gray Hyundai Genesis with the victim’s phone, a credit card, and $7 cash. Officers who were working on an unrelated case nearby reportedly saw the getaway car speed southbound on Lake Shore Drive after blowing through a red light at Belmont and Sheridan around the time of the hold-up. The offenders are described as two black men who stand about 5’9” tall and weigh about 150 pounds. The driver had a short haircut and the passenger had dreadlocks. Both were armed with handguns, the victim said. Today’s hold-up is the second armed robbery to be reported in the Walgreens parking lot since July 6. In a separate case, a woman reported being carjacked at gunpoint near the 19th district police station this morning. The victim said that a man with a hoodie covering his head produced a handgun and took her Toyota RAV4 near Broadway and Stratford just before 5AM. 18th district officers found the stolen car about 20 minutes later at Eugenie and Wells in Old Town. The woman’s purse was still inside, but its keys were missing, officers said. The victim was unable to get a good look at the robber, but he is being described as male, black, and 5’10” tall.